Featuring accounts in many cases in excess of £100k per year. 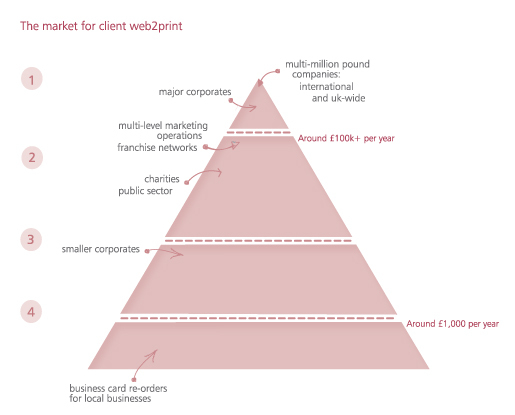 Corporates, franchises, charities…the multi-site nature of these organisations seems to lend itself to web-2-print. Address changes, local offers etc add to the link between these businesses and web-2-print. Although the potential revenue may be lower than for multi-site organisations, the scope exists to cater for the print-buying needs of most commercial organisations. Think local businesses with 10 or more employees – lawyers, accountants, recruitment firms etc. The scope may not extend much further than business cards and stationery, but in this case web-2-print can act as a door opener and could lead to further offline sales. With this in mind, we can start to adapt sales pitches to the different segments of the market. We’ll be looking at how to do this over the next few blog posts. If you’d like to know more about selling web-2-print please request a free copy of our book Web2Print MD2MD.